Collaborative colleagues celebrate the latest achievement of Paul Kreisinger. 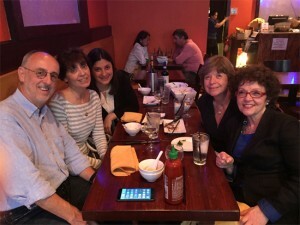 On July 24, 2015, at the Mekong Delta Restaurant, in Ridgewood, NJ, Paul Kreisinger, esq, MSW, was celebrated for becoming a Licensed Clinical Social Worker. He has recently opened his private psychotherapy practice, in Ridgewood, in addition to his law practice. Paul, a Renaissance man, regaled his mental health colleagues with his professional ventures, as well as his nonprofessional activities. He is husband to a professional wife, doting father of an accomplished daughter, a musician and more lately, an exercise aficionado in addition to attending conferences far and wide. Attending mental health professionals, Shireen Meistrich, Elisabeth Curshen , Toby Friedman and Sharon Klempner admired his endless energy and good humor. All enjoyed a scrumptious meal, chosen and prepared by the chef, and the camaraderie between members of the Collaborative Divorce Association of North Jersey. We not only support each other professionally but also enjoy each other’s company, a plus, in trust, when working together as a team for clients. This entry was posted in Press Release by Xs1njcollablaw. Bookmark the permalink.